The book is a compact training manual that is divided into two parts. The first part deals with training theory while the second contains background information about the sport and its stars, thus giving the reader an overall insight into the world of badminton. The book is groundbreaking in many ways. 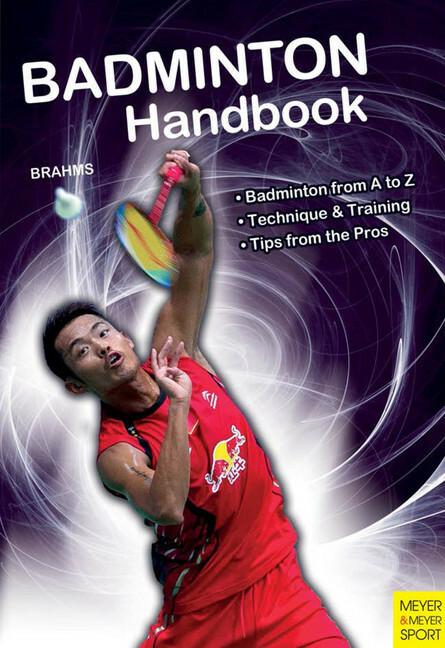 It combines training theory and information about badminton stars by reinforcing basic explanations on badminton technique with tips from the pros. It not only relates the excitement of this sport with Asian origins, but tells you all you need to know about badminton from A to Z. It is a reliable reference book that readers will want to turn to again and again. Bernd-Volker Brahms (pictured here with Lin Dan, the most successful player in Badminton history) was born in 1969. He is a journalist and has been writing about badminton for various national and regional publications and TV stations since 1992. He is an expert on the international scene and regularly attends all the major tournaments like the Olympic Games, World and European Championships and the German Open. Fig. 4: Danish Youngster Victor Axelsen with his Adidas equipment. One of the reasons for the big improvement in the standard of world-class badminton is the improvement in the standard of the equipment. These developments mainly concern the racket , the stringing and the shuttlecocks . But clothing and shoes have also adapted to the demands of a performance sport, not forgetting special racket covers and sports bags that have evolved to meet top players' requirements. While in the 1980s rackets weighed between 100g and 130g, good rackets now weigh around 85g. However, rackets can still be strung to a hardness of up to 14kg. The parts of the racket are grip , the stringed area , the head and the shaft . From the origins of the sport until the 1970s, rackets were entirely made of wood . Rackets were kept in frames when they weren't being used to stop them becoming warped. Only with the professionalization of the sport did Asian companies start experimenting with materials other than wood. To start with, the shaft and frame were made of light metal , steel , aluminum , and later of carbon-graphite (manmade fiber made from carbonized bitumen). This helped firstly to reduce the weight, and secondly to increase the stability of the whole racket. Today, materials like fiberglass and synthetic fibers (boron , graphite , Kevlar ® and Magan Beryllium ® ) are also used. The materials have a very high resilience and are significantly firmer than steel, but most importantly have greater elasticity . Rackets also no longer consist of separate parts, but the head and shaft of the more expensive rackets are of one-piece construction . The above materials make the rackets lighter and more flexible. In particular the elastic shaft allows the player to hit the shuttle with more whipping power , allowing him to hit the shuttlecock harder and faster, but the flexibility of the racket head is more of an impediment as it reduces stroke precision . The rule of thumb is: the harder the frame, the more accurate the strokes. Expensive rackets are characterized by low torsion (torsional rigidity of the shaft). This is measured by to what extent the racket head turns left or right around the longitudinal axis of the shaft . If the player hits the shuttle not with the center but with the edge of the racket , it can be returned equally as well by a racket with low torsion as a shuttle that is hit with the center of a cheaper racket. Another property of the racket that influences the play quality is balance . There are head and grip-heavy as well as balanced rackets on the market. Basically, head-heavy rackets offer greater acceleration in the smash, while grip-heavy models are better suited to defensive play , as they allow for greater accuracy . Balanced models are a compromise between the above. You can test which category a racket falls into by balancing it on your index finger at the point where the shaft joins the head.